Fresh from taking over as CEO of the Association for Healthcare Documentation Integrity (AHDI) and the Clinical Documentation Industry Association, Nancy Brighindi, PhD, CAE, took time to answer a few questions about what lies ahead for the transcription industry. For The Record (FTR): What’s your first order of business as CEO? Brighindi: My professional background is in association management, and my first order of business as CEO is to work with staff, leadership, and members to learn all I can about the industry and sector in order to grow the existing membership base, strengthen partnerships, increase programming, develop leadership, market credentialing, and increase coalition activities. 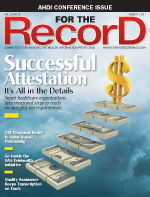 FTR: Reports are that medical scribes are playing a bigger role in the documentation process. Do you plan to address this issue? Brighindi: We are seeing scribe roles emerging in clinical settings where an on-site documentation support role is of increasing value to the clinician, as in the [emergency department (ED)], but only time will tell how significant this role will become beyond the ED and what standards and accountability to quality and privacy will be built around that role. AHDI will continue to seek an open dialogue with scribe organizations and their new professional association to see where our roles and standards intersect. FTR: What steps can medical transcriptionists (MTs) take to ensure they’re viable as more providers go electronic? Brighindi: As providers go electronic, there is an extremely important role that MTs play in the bigger picture and many ways that their valuable skill set will be used in the healthcare field. Through professional credentialing, MTs can show their dedication to their profession, make visible their scope of practice to healthcare, and position themselves to generate confidence and trust in their role. In addition, MTs will likely have to embrace retooling and training in emerging technologies to remain relevant as the EHR evolves. FTR: What advice would you offer someone considering a career as an MT? Brighindi: I would advise anyone interested in a career as an MT to be dedicated to lifelong learning. The skill set they will bring to the healthcare area is an important one. They should consider credentialing to stay in the forefront of the profession and quickly become engaged in AHDI’s activities so that they continue to stay ahead of the curve. FTR: What are your thoughts on credentialing? Brighindi: Recognized credentials build confidence and trust in a vocation. Earning and maintaining certification shows that you have taken serious steps to advance your knowledge base, and it is a tremendous achievement. In an industry like this one, where visibility and understanding around the role MTs play is a constant challenge, credentials are even more critical. They wave a banner over the skill set of this profession and get the attention of those who lack understanding about what MTs contribute to the process. FTR: What do you say to healthcare organizations that consider transcription a prime area in which to cut costs? Brighindi: Because transcription is a cost center on any healthcare facility budget, those making decisions around cost containment make the unfortunate mistake of discounting the value of transcription in generating revenue—ie, maximized reimbursement relies greatly on an accurate, comprehensive healthcare record for coding and billing. Greater education of key decision makers in healthcare needs to take place so that documentation support is seen as a value rather than a liability to the budget. FTR: How will you help change the perception of some in other healthcare professions that MTs are “secretaries”? Brighindi: First and foremost, there needs to be an open line of communication, collaboration, and mutual respect among allied health contributors. MTs hold a very important set of skills that the healthcare industry relies on. Unfortunately, some see MTs as “just typists” because they lack an understanding of the complexity of that role. The only way to change that is to build alliances with healthcare providers and organizations that need better education about the contributory value of MTs and promote professional credentialing as a means of demonstrating that this profession embraces professional standards.